Mexican tourism minister Miguel Torruco is eager to close the gap between the number of visitors his country receives and the amount of money they spend. Torruco said during the closing of the country’s Tianguis tourism show this week, that Mexico is now the seventh most-visited country in the world but ranks 16th in tourism revenues, leaving 15 nations ahead of it. The measure of tourism success shouldn’t be the number of visitors a nation hosts but the money it earns through tourism, he told his Acapulco audience. Mexico also lags somewhat when it comes to the amount the average tourist spends, he noted. Mexico hopes to see over 43 million tourists this year. Torruco said his homeland got off to a strong start this year with visitations in the first two months of 2019 up 4.4% from the same period last year. Meanwhile, Torruco declared this year’s Tianguis a success, with the show seeing a record number of meetings between exhibitors and buyers. Next year will see Tianguis will be in Merida, a first for that destination. 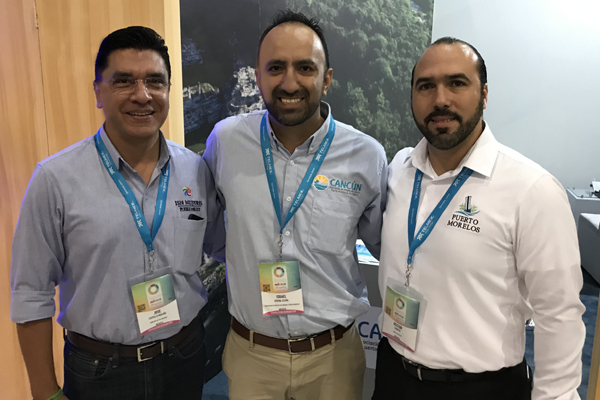 From l to r, are Isla Mujeres’ Jose Castillo; Israel Urbina of the Cancun Hotel Association; Hector Tamayo representing Puerto Morelos.